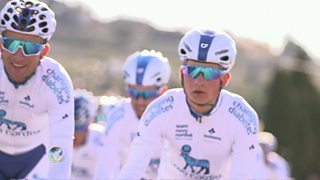 The cycling team of Novo Nordisk is different from most others, every member has diabetes. There are 400 million people worldwide with diabetes and four million in the UK. Team Novo Nordisk aims to inspire and educate people around the world about the disease. Watch more reports from Victoria Derbyshire. You can find out more about how to get into cycling with our special guide.